$100 $100 bonus after spending $1,500 in purchase transactions within the first 90 days of account opening. 0% APR promo balance transfer rate for 12 months now through September 30, 2019. After that, the APR for the unpaid balance and any new balance transfers will be 9.24% to 17.99%. APR will vary w/the market based on Prime Rate. 3% balance transfer fee per transaction. Subject to credit approval. $100 bonus after spending $1,500 in purchase transactions within the first 90 days of account opening. 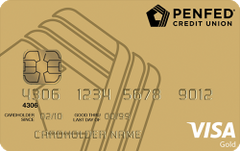 Our take: The PenFed Gold Visa card offers one of the lowest standard APRs you can get on a credit card and relatively few fees; but it’s only available to cardholders who qualify for Pentagon Federal Credit Union membership.